Waldo Rochow, MBA: What's the FUTURE of SHOPping? Here we go again! CBC is reporting that another 1500 retail jobs are lost in Canada as Best Buy shuts down its Future Shop subsidiary. 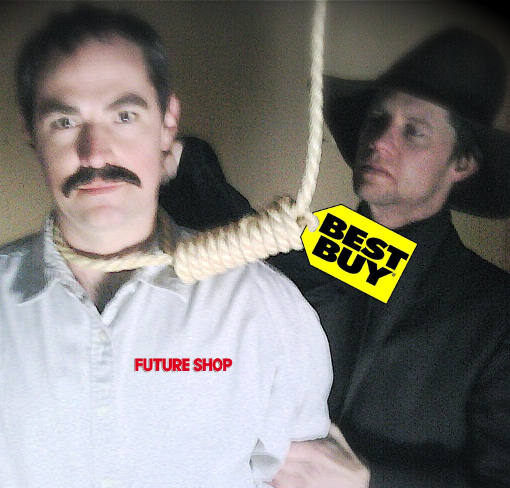 Best Buy bought Future Shop in 2001. I would have expected them to have sorted out the competing stores well before now. I get it, big fish eat little fish, and there will always be a bigger fish. As I understand it, the employees are being well treated and presented with choices. But this still annoys me. Another Canadian brand dies at the hands of an American company. The Government of Canada should force any companies that buy Canadian businesses to leave the country if they find that they cannot make it here, and restore the brands they destroyed. In this case, it should be the Best Buy stores that are closing, and the Future Shop stores that remain. It may sound like semantics, but every day, Canada is losing a little of its identity. Admittedly, the real trouble is that Future Shop shareholders valued the $580M more than the pride of owning a piece of a successful Canadian brand. I suppose in hindsight, they are probably happy to have been rid of it instead of having to do battle with the American giant. In the end, this is another example of a retailer shooting itself in the foot. They say it's because they are losing to online shopping, but they are hosting online shopping websites. Retailers have to provide value to the consumer that cannot be matched in the online world, and focus their efforts on that. Here's a common scenario. You go into a retailer and stand in the aisle comparing two products. Magically, a sales associate appears and asks if you need help. You say "Yes, I'd like to know what's different between these two brands other than the $50 price difference." And the well meaning sales associate proceeds to read the two boxes. You walk away thinking to yourself: "I should have just read the reviews online and ordered it there."